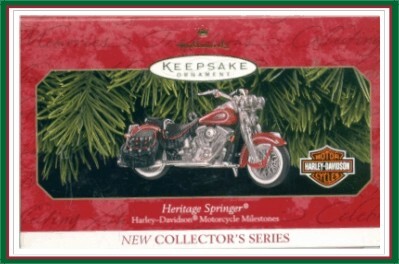 First (#1) in the Harley-Davidson ® Motorcycle Milestones Series, this ornament is Die-Cast Metal and dated 1999. Sculpted by Don Palmiter. QXI8007. Significant milestones in the proud 96-year history of the Harley-Davidson ® Motor Company will be highlighted in this series of ornaments. Leading off the series is the Heritage Springer ®. Considered the ultimate styling accomplishment, it successfully combines modern technology with a vintage look. It delivers the great ride and mechanical sophistication of the Harley ® today -- while preserving the look of the 19183-style hardtail frame and springer-fork front suspension. This timeless Heritage Springer, introduced in 1997, is shown with a 1999 paint scheme.